This classic military-style boot is a favorite for those who need a boot that can take a parade-ready shine. Oil-tanned leather construction with a smooth toe cap shines quickly to keep you looking sharp. A moisture-wicking liner keeps your feet dry and comfortable over long shifts. The convenient side zipper allows fast and easy on or off. I LOVE the boot, but for the price, I expect the side zipper to last more than six months. Yes, I do a LOT of walking on concrete, but the soles show little to now wear and the boots have been kept spit shinned and clean and seen mostly indoor only use. Thororgood's answer to my inquiry of there "one year" warranty was IF they deemed it defective after I shipped the boots to them on my nickel, they might replace or prorate a replacement. Please email them pictures and a copy of my invoice. And to top that off, I get a zero response 3 business days after the phone conversation and emailing what they wanted. Find the extra funds to buy a quality jump boot from another manufacturer. 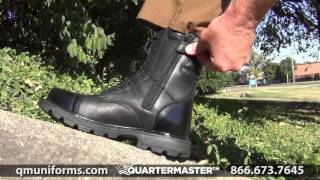 I bought these boots due to the reviews and recommendations of other officers. They were great, no break in period needed. Not only are they comfortable but easy to keep a shine on when appearance is important. However, after 11 months I saw the sole was wearing out and after 12 months the stitching to the toe cap came apart on my left boot. I'm going to get another pair and see how they fair, I should get more than a year of patrol out of them. First pair from this brand and in over 17 years of law enforcement they are the most comfortable so far. Seem very sturdy and well built like they are ment for tough work. Hiked five miles today on my first day wearing them in some unforgiving terrain. No slips great grip on rocks dirt wet grass etc. don't feel like they will need a breakin period either. Time will tell as it does with all gear but as of right now I'm very impressed and willing to say these will be my new patrol boot. Already looking to but a second pair. Only question is i ordered these from quarter masters and my credit card listed the purchase from GALLS. First thought it was a fraudulent charge. I'm assuming quartermasters and galls are connected. Somehow I missed that. Just FYI. These shoes look nice in class a/b uniforms just make sure there shined up. Look like a professional. We're the toughest beat! Awesome! !..i had been using different kind's of boot's for almost 9 year's in service,this pair of boot's is the best i ever had..Very professional lookin,the quality is perpect and its very comfortable to wear..Highly recommended this boot's to any Law Enforcement and Uniformed person's..
Great quality and very comfortable!!! Using for every day motorcycle riding and long distance touring!! Awesome boots, I actually enjoy shining these boots. I'm not a cop but I am in a uniform and provide medical emergency care and look sharp as hell in these. This has been the best boot for 2 plus years. Does need insert for long hours. Otherwise looks great and feels great! Best boots I've ever owned in my nine years of corrections. They don't need to be broken in and they last for years. This is by far the best pair of boots I've owned in my 9 year's with corrections. They don't need to be broken in and are very comfortable. AWESOME! QM is the best! I have been buying since your catalog was only about 40p. (15yrs.)! I can't believe it took so long for me to find these PERFECT boots. The first pair I ever wore without inserts 12 hours in industrial work without changing to my spares no break-in needed. 20 months before the zipper pull cracked. The heels show little wear. I never had boots last more than a year. I'm buying my second pair now before I need them. Best boot I've ever owned. I've had them for a year and they are still holding up great. The best pair of boots I've ever owned in my 8 yrs in corrections! Looks great and is very comfortable! Several compliments from all the staff! Q: Are these boots metal detector friendly? A: "Yes. The Thorogood All Leather 8"" Side-Zip Jump Boots are ideal for Dept. of Corrections or any situations where you have to pass metal detectors. " Q: Are these boots good for women? A: "The Thorogood All Leather 8"" Side-Zip Jump Boot can also be worn by women. The listed sizes are listed in men's sizes. Typical upsizing for women would be to add 2 sizes to the listed size. For example, a 5 M (medium width) should fit a women size 7. "